While the number of tourist visiting Rwanda is increasing ( 1 millions in 2012), the country received a "major" boost, last week. In deed, Top Gear which is one oldest TV show in BBC, filmed an episode in Rwanda. This episode is a part of the "African Trip". With almost six million viewers watching epic scenery as the Top Gear ‘Big Three’ took to the bumpy African road, it was bound to get people inspired to travel. Leading tour operator, Scott Dunn, has seen a 23% increase since Sunday, compared with the week before, in enquiries about driving holidays through Africa. The Top Gear Africa special, which aired on Sunday 3rd March was the first of a two-part installment and averaged 5.7 million viewers. 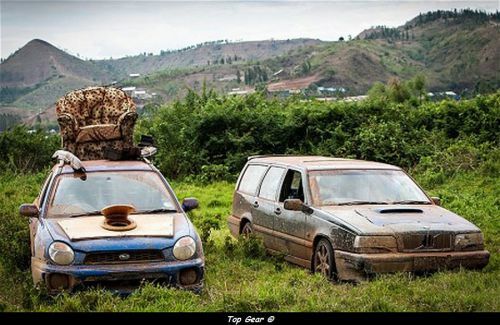 The show saw the Top Gear three embark on an epic adventure through East Africa to locate the true source of the Nile. Episode one saw them driving to Rwanda from Uganda ending up at the end of the episode on the banks of little-known but stunning Lake Edward. In three cars bought for under £1500 they took on river crossings and African roads to journey across increasingly tricky terrain. Episode two of the special will air this Sunday showing the intrepid three continuing the adventure driving around Lake Victoria to Tanzania believing that the Grumeti River bordering the northern Serengeti is in fact the true source of the Nile.